A traditional pub with a good atmosphere in the middle of the hoo ray Henry land of Belgravia. A good layout, a pool table and down to earth friendly regulars. The beer selection is a bit unadventerous but they have London Pride on draught and it's well kept so for the tradtional English ale drinker you can probably drink that all day long. Well worth a vist. 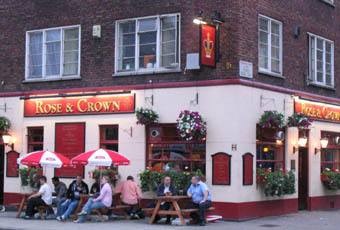 Long may pubs like this continue as genterification continues. Excellent proper pub. Good quality beer, cheap food and a friendly welcome from staff and other customers, not what you would expect to find in this area! Worth making a detour from Kings Road to find this. Uninspired pub with little of interest in decor, atmosphere or beer (Spitfire, Bombardier, the former was had and was fine). I meat to say 'Nice little boozer with decent PRICES'. The Masons at Queenstown Rd could learn from this place.